Mokupāpapa (literally, flat island) is the name given to Kure Atoll by officials of the Hawaiian Kingdom in the 19th century. (Papahānaumokuākea) It is approximately 1,200-miles northwestward of Honolulu and 56-miles west of Midway Islands. The International Date Line lies approximately 100-miles to the west. Kure Atoll was found in 1823 by Captain Benjamin Morrell, Jr. of the schooner Tartar, who claimed Kure to have an abundance of sea turtles and sea elephants. In 1827, the Russian ship Moller, under Captain Stanikowitch re-discovered the atoll; he named it “Cure Island” to honor a Russian navigator. (cordell-org) It is more generally known as ‘Kure’ today. Hawai‘i’s whaling era began in 1819 when two New England ships became the first whaling ships to arrive in the Hawaiian Islands. At that time, whale products were in high demand; whale oil was used for heating, lamps and in industrial machinery; whale bone was used in corsets, skirt hoops, umbrellas and buggy whips. Rich whaling waters were discovered near Japan and soon hundreds of ships headed for the area. The central location of the Hawaiian Islands between America and Japan brought many whaling ships to the Islands. Whalers needed food and the islands supplied this need from its fertile lands. The crew established a makeshift camp on the island and passed their time picking up pieces of the wreckage that had been washed over the reef and into the lagoon with the intention of constructing a vessel from the salvage. After assembling axes and adzes, necessary for building the craft, from whale spades and augers and chisels from lances, using the salvaged material, the keel of a 38-foot boat was laid two weeks after the loss of Gledstanes. Within several months, the vessel was completed and determined to be seaworthy; it was named ‘Deliverance.’ Captain Brown and eight others set sail for the Main Hawaiian Islands, while the rest of the crew remained on the island. While en route, Deliverance encountered the American ship Timoleon, who supplied them with much needed provisions. Deliverance arrived at Honolulu sometime in November, 1837, while the remaining crew on the island was rescued several months later. Researchers discovered evidence of the Gledstanes wreckage in 2008. The site consists of mainly large heavy artifacts scattered over a 200-foot section of the reef at depths ranging from 6 to 20-feet. Artifacts include four large anchors, what appear to be two cannons, a try pot (a cauldron for rendering whale oil,) a pile of anchor chain, approximately 50-pig iron ballast bars and copper fasteners of various sizes. Some of the artifacts are extremely eroded, suggesting that they are affected by scouring due to wave and current activities. The distribution of the site suggests that the vessel hit the fringing reef and broke up, leaving artifacts resting on the reef top and cuts in the reef. Unlike all other islands and atolls in the Northwestern Hawaiian Islands, Kure Atoll is the only land area owned by the state of Hawaiʻi – all of the other Northwestern Islands are owned by the US government. This started a process where several others followed with similar protective measures. The BLNR unanimously adopted the State’s Refuge rules, President George W Bush declared it a Marine National Monument and UNESCO designated it a World Heritage Site. 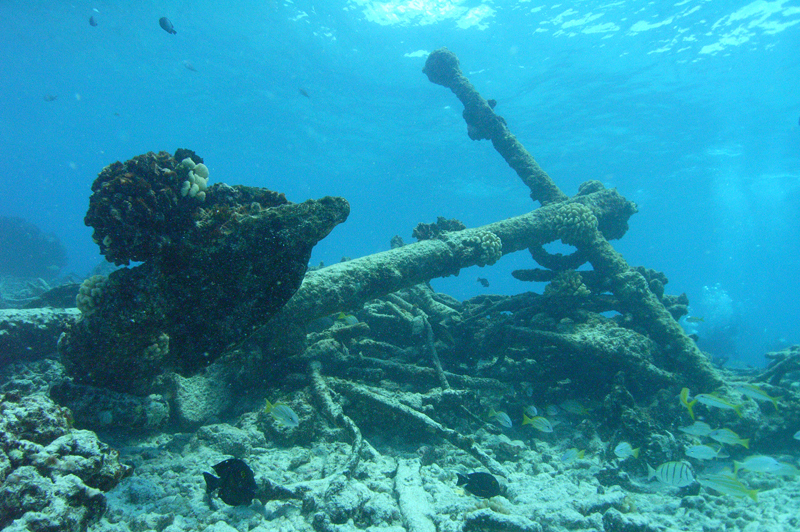 The image shows an anchor from the Gledstanes wreckage (NOAA.) In addition, I have included other related images in a folder of like name in the Photos section on my Facebook and Google+ pages.